Governments and developers love issuing press releases announcing the opening of shiny new schools, rec centres and office buildings. Chances are good these days that building will be LEED silver, gold or even platinum. The US Green Building Council created LEED in the 90s and it came to Canada in 2002. Its goals are simple: it wants to create resource-efficient, high-performing, healthy, cost-effective buildings. LEED is an acronym for Leadership in Energy and Environmental Design and over time it become the most used green building rating system out there. According to Tanya Doran of the Green Building Council, Alberta Chapter, Canada has over 5,000 buildings that are registered for a LEED rating and 2,000 LEED certified buildings. LEED was created with lofty goals and 28.8 million m2 of LEED projects have been built in Canada but what has it achieved? 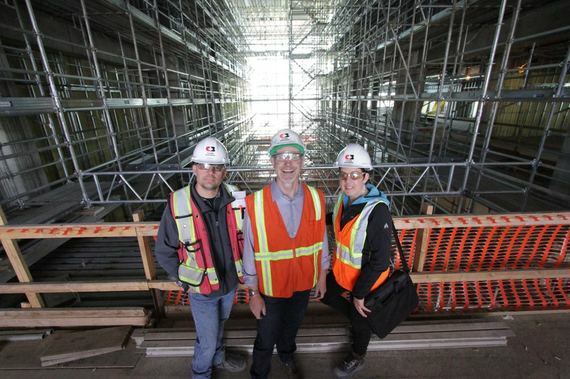 Cam Munro is the Innovative Construction Manager at Clark Builders in Edmonton, Alberta. 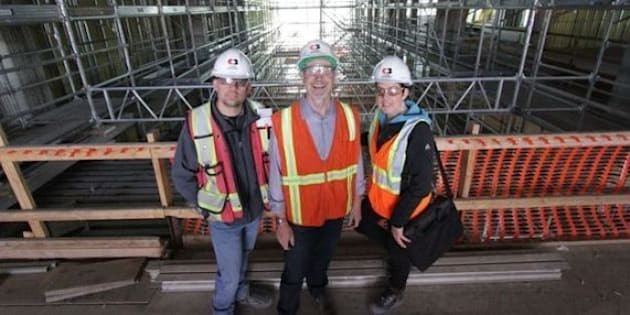 He can thank LEED for his title and right now 50 per cent of their 2014 projects at this large construction company are pursuing a LEED certification. We talked to Munro on the NAIT campus in Edmonton where they are building the new CAT Building, Clark's 61st LEED project. Clark took on its first LEED project in 2003. "It was a big learning curve," says Munro who admits just surviving their first project was an accomplishment "And then within a year, right on the heels of that project, another one came, then another one and then another one." Munro says 15 years ago his company would have been happy diverting 10 to 15 per cent of its construction waste from landfills. "Today, we've got numerous projects that are over 95 per cent diverted from landfills," says Munro. And the project we were touring sports a 98 per cent waste diversion rate. Since 2005 LEED builders have recycled more than 2.7 million tonnes of construction and demolition waste in Canada. LEED rewards builders for using locally sourced materials, environmentally friendly glues, paints, primers, sealants and materials with low or no-VOC and no added urea-formaldehyde. Munro says many of these materials were hard to get in 2003, but today they are readily available: "We're changing internally our processes so that everything we're doing could be a LEED job even if it isn't." Clark Builders doesn't even stock materials that don't meet these LEED requirements, because it's not worth the hassle to source and separate them. By default even non-LEED projects get greener, healthier materials. Since 2005 LEED in Canada is responsible for saving 2.6 million megawatt hours of electricity, enough energy to power 89,000 homes in Canada for a full year. To meet LEED standards buildings must be at least 30 per cent more energy efficient than the building code. Companies like Clark have learned to build these buildings with more efficient mechanical and lighting systems. LEED has been so successful at ratcheting up energy efficiency that the new building code will require all buildings to be 25 per cent more efficient-the new normal is LEED. Lately we're seeing more and more LEED buildings adding solar energy to the mix and one recent project even went well beyond LEED all the way to net-zero. "LEED has probably done more for the building industry than [the development of] structural steel buildings in the 1860s. LEED has literally made leaps and bounds, because it's forcing people, engineers, design, builders, owners to think differently," says Munro. Munro says owners build LEED for two reasons: ego and dollars. "A developer friend of mine had said from his standpoint, it's purely money driven for him," says Munro. "Our cost is $3 a square foot to build a LEED building, but I can charge you $5 a square foot more which is $2 in my pocket. So, everybody wins in that situation. He gets his money and the building gets built in a much more sustainable way." Studies have shown that LEED buildings find tenants easier and can charge more for rent. LEED has legitimized and mainstreamed green buildings. By making it a financial play as much as a PR play you can justify going green to the bean counters who make the financial decisions of the world. LEED buildings also help workers. For an extra one to three per cent of the cost of the building the owners get more productive workers who take less sick days. The actual nuts and bolts of certifying a LEED building aren't the most fun. The points based system is a bit of a cross between doing your taxes and filing a lawsuit. It takes time and money to build the capacity to be able to do it and not all companies have the resources. Munro said he would even pay more if they could get an official LEED person on site to speed up the certification process. Perhaps its biggest drawback is that it's only a design tool and it doesn't measure actual building performance after a building is certified. But even with those caveats when you do the math and look at the impact it's had on the building industry its pretty clear LEED is a win for the good guys. It has changed the building industry for the better. They're building more energy efficient buildings with greener materials and sending less waste to landfills.